This rain cover fits all EOS cameras with a standard flash hotshoe or flash bracket. 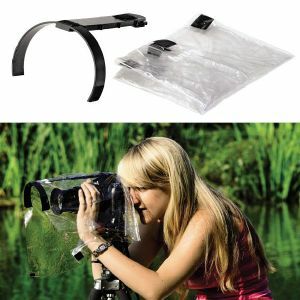 Protect your EOS camera from rain, snow and dirt while shooting with this Hama Rain Protecion Cover. The semi-circular bracket on the holding arm keeps the cover away from the lens. The holding arm is adjustable from 17-27cm. Comes complete with 2 storage cases for the holder and the protective cover.